Notre Dame alumnus, 2x Pro-Bowler, 2x Super Bowl champion, & New York Giants Ring of Honor inductee. While he may not be regarded as the greatest tight end in history, Bavaro holds a special place in the hearts of NY Giants fans. 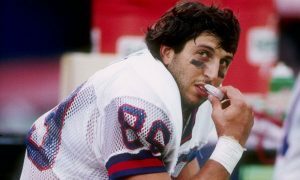 Join Thuzio for an up-close-and-personal meet & greet with New York Giants legend Mark Bavaro. Enjoy a complimentary open bar courtesy and passed hors d’oeuvres before hearing from 2x Super Bowl champion Mark Bavaro in an in-depth Q&A moderated by Thuzio Co-Founder Tiki Barber.